Peter Drucker laid the foundations of modern management insisting that you can’t improve, what you can’t measure. In urban planning, this line of thought has transformed the way we set goals, track progress and analyze the effects of implemented projects and policies. Urban performance measures help communities make informed decisions and measure results against goals. 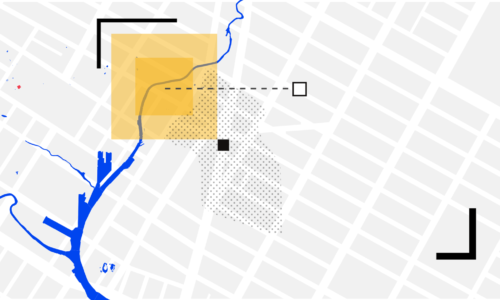 In this story we discuss some of the most important urban metrics to be taken into consideration when exploring the urban environment both on the neighborhood level and on a broader city-wide scale. Land use diversity is a key component of compact liveable communities where everything is within reasonable distances. This can range anywhere between 5 to 20 minutes of walking distance to a park, public space or a cluster of services. 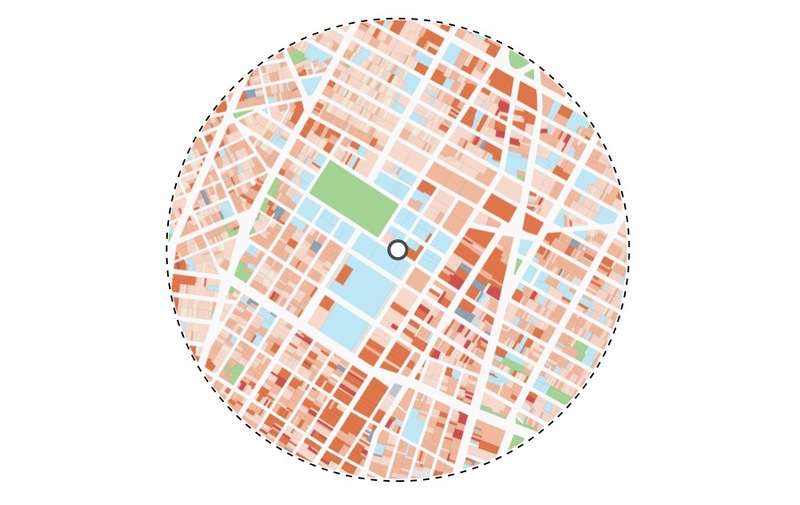 We explore land use data to determine access to public spaces and institutions, parks or even vacant land for future development. 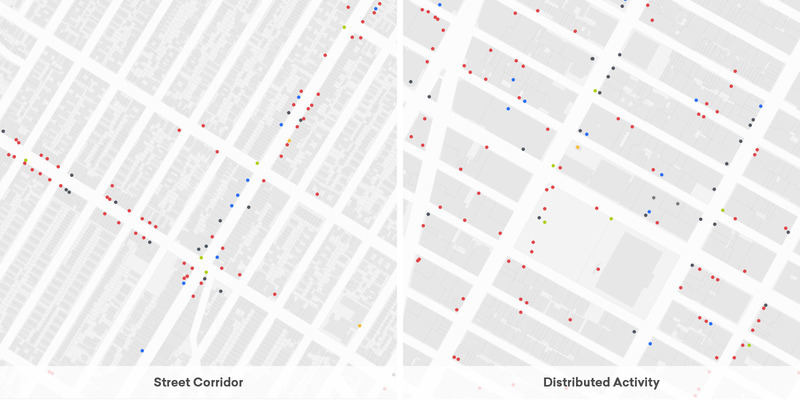 This observation is helpful for establishing the number of potential destinations in a neighborhood and for drawing a more general conclusion on walkability. While public spaces and local centers act as anchors that allow people to meet and socialize, housing is the key to population density that actually brings people together. Points of interest provide a reason to walk. This can be a place to eat and drink that you just discovered on Foursquare, the nearby school from where you pick up your child every day or the local grocery store. Points of interest may be clustered around a local center or distributed along a main street. Ground level commercial activity provides not only a reason to walk. It also ensures transparent facades, more eyes overlooking the street and a safer urban environment in general. Points of interest can also include medical facilities, high-density residential or office buildings, places of worship or any location that attracts people. Programming land use sometimes requires building a public consensus around an idea. And this process needs agile planning moves. A great example of this kind of strategic design is the work of Milan Lenuci in the city of Zagreb, Croatia. Between 1860 and 1920, Zagreb became a stage for a series of strategic planning moves. 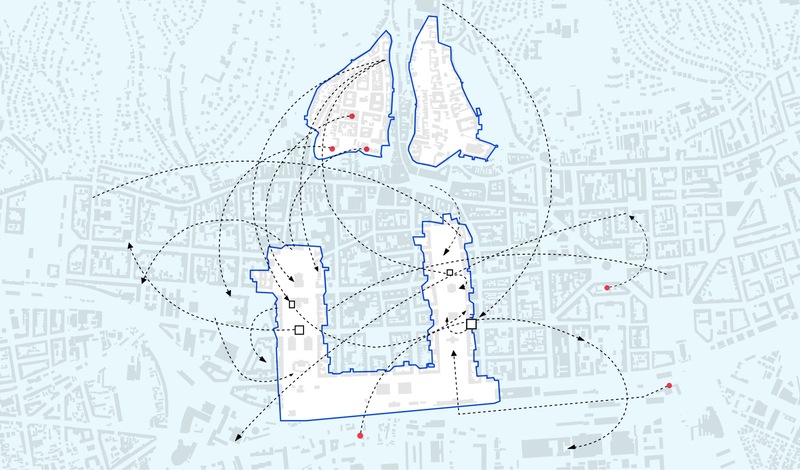 During that period, the city’s surveyor – architect Milan Lenuci – choreographed public events, organized fairs and built temporary structures in order to transform vacant sites into a new public core. Resituating institutional building and facilities from the old town to Lower Town in Zagreb. 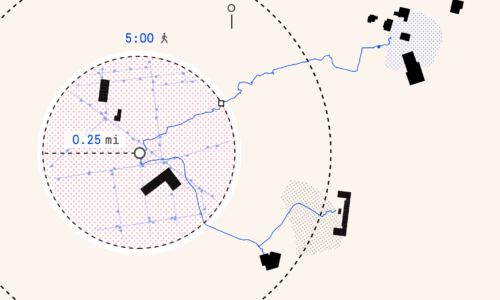 Map based on "Green Horseshoe as unfinished figure, 1861-2007" from "Project Zagreb" by Eve Blau and Ivan Rupnik. Inspired by Vienna’s Ringstrasse, Lenuci envisioned a new town center in The Lower city – the area between the railway and the old city center. Through a series of interventions and informal planning practices, he programmed the space and preserved it from future development long before the Horseshoe actually appeared in regulation plans. To fix the figure of the Horseshoe as a new urban center, Lenuci began to build public awareness of the area as a new place for recreation. The space was dedicated to tennis and soccer in the summer, while during winter it was transformed into an ice skating park. One by one institutional buildings such as the National Theater, University Library, Chamber of Commerce and School of Arts and Crafts were built on the site. Compact and connected urban environment is the ultimate anti-sprawl strategy as we try to reduce our carbon footprints and reverse the effects of climate change. Denser cities encourage walking, allow for shorter trip lengths and complement the benefits of mixed land use. 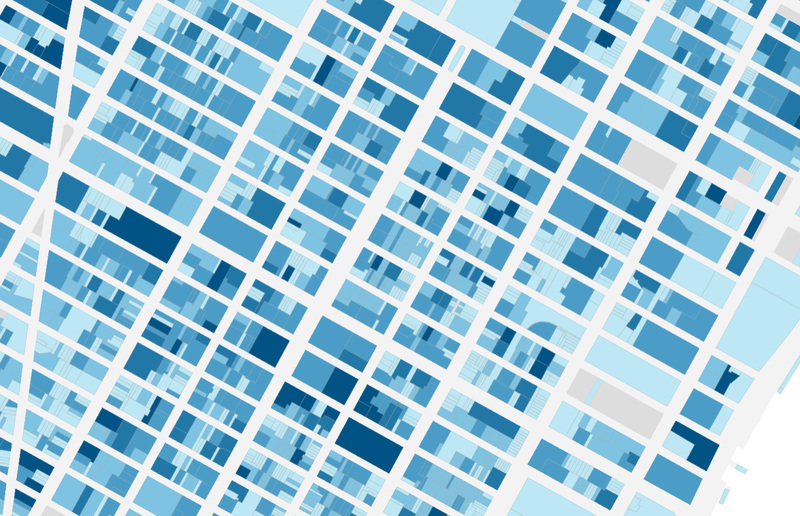 There are different ways to measure density but the three most common metrics are population density, floor area ratio (FAR) and the number of dwelling units per land area. FAR is defined as the relationship between the total usable floor area of a building and the area of the lot upon which it is built. Dwelling unit density refers to the number of homes in a land unit. 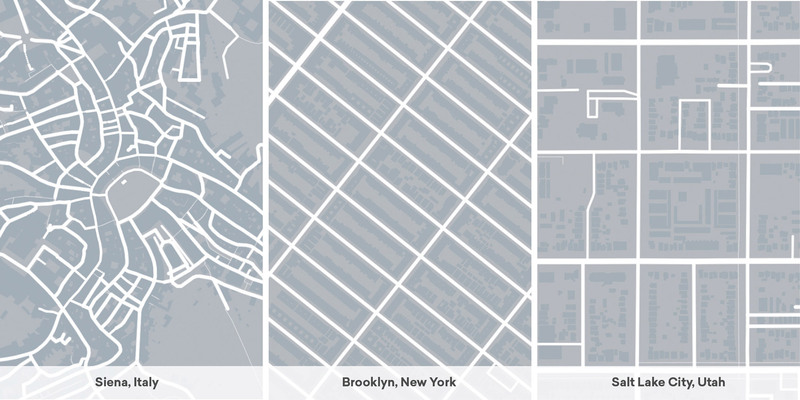 Intersection density is closely related to the block size and respectively – to the scale of the city. It refers to the number of intersections in a given area. 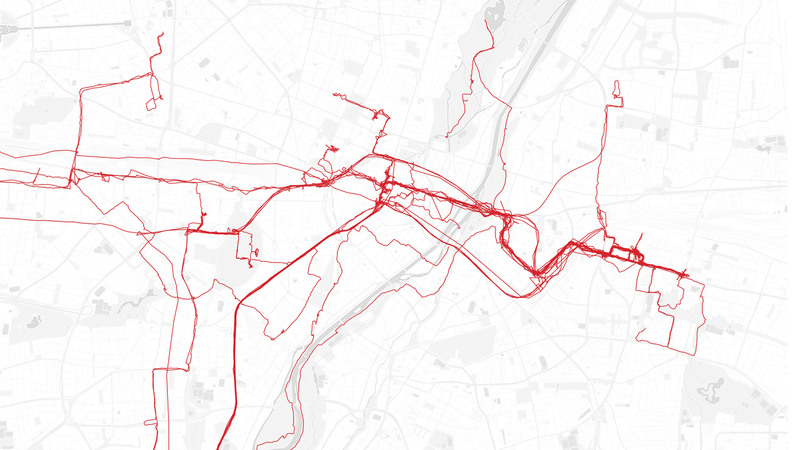 A well-connected street network allows for shorter trip lengths and encourages walking. In her seminal work “The Death and Life of Great American Cities”, Jane Jacobs identifies short blocks as one of the generators of diversity. As Jacobs states, shorter blocks result in more intersections and ultimately – in more opportunities for people to meet. Mobility metrics evaluate a city’s ability to allow flows of goods and people to move efficiently. These metrics usually observe volumes, capacity and travel times. For example pedestrian volumes, number of transit riders or the number of people in private motor vehicles are key performance measures. Mobility can also be measured in terms of access to destinations in set amounts of time or simply by the number of bus and transit stops that you can reach by foot. Research suggests that most people are willing to walk for about five minutes before opting to drive. That is why the 400-meter buffer (0.25 miles) is usually applied around bus stops and the 800-meter buffer (0.5 miles) – around rail stations. Safety can be measured by the number of car crashes or the proportion of pedestrian and cyclist fatalities in road traffic accidents. It also refers to crime statistics and includes datasets on felony, misdemeanor or violation crimes reported to the local police department. But safety can also be a perceived quality of the urban environment corresponding to the number of people engaged in stationery activities on the streets (public space canvassing). Street design has a direct impact on safety. For example, reducing street width can limit speeding, improve the pedestrian experience and encourage walking. That is why “skinny streets” programs have been implemented in cities all around the world. A city’s economic vitality depends on a number of factors: some of them are location-specific, while others reflect its connection to global transaction chains. In general, there are two driving forces that lead to the concentration of jobs and economic activity in densely populated urban areas. Scale economies encourage the formation of large business and production establishments, while agglomeration economies encourage businesses and services to cluster together. And this is what ultimately attracts people in the compact setting of a large city. There are numerous indicators for economic vitality. Data on new development in square footage or financial investment; real estate sales; rent and property values are all metrics that should be taken into consideration. Demographic data on employment rates; access to jobs and services also reflect a city’s economic prosperity. On the neighborhood level, local retail sales are great short and mid-term indicators for evaluating the effects of streetscape improvements, renovation and capital projects. Census data is one of the best sources of demographic insights and allows to isolate trends both on the micro level of the neighborhood and the macro level of the entire city. We can observe how population declines over time, identify displacement processes or enclaves of ethnic minorities. 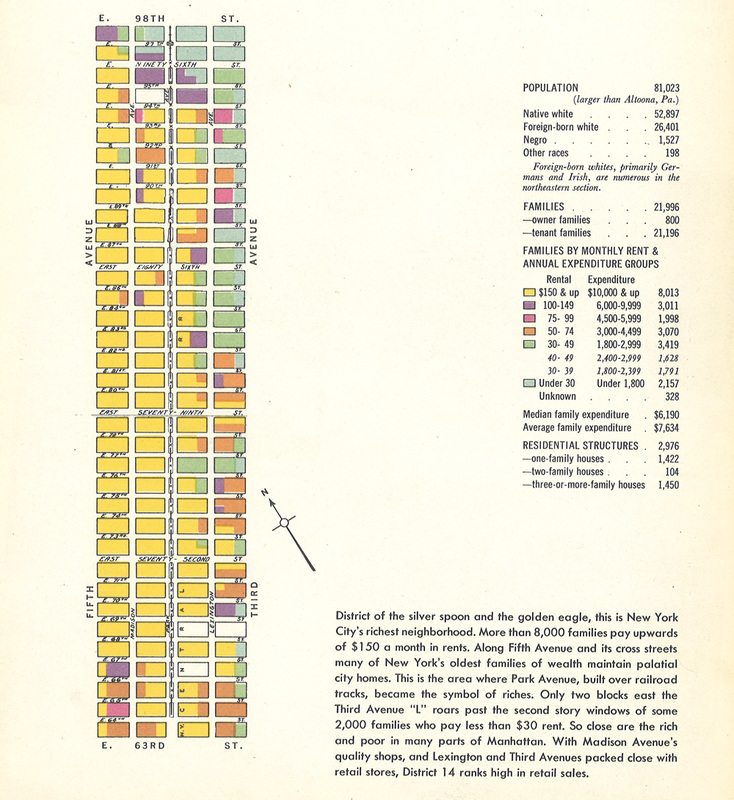 A 1943 New York City Market Analysis featuring demographic data. Upper East Side is described as “district of the silver spoon and the golden eagle”. Besides race and ethnicity, household income and poverty rate are key demographic metrics. When paired with data on education, labor market and crime these metrics provide a socio-economic profile of the population. That is why census data is key for identifying signs of gentrification and racial inequality. The quality of public space is a snapshot of the quality of life in a city. Well designed public spaces have good pedestrian, bicycle and transit connectivity. They also provide comfort and multiple opportunities for people to socialize. People enjoying street seats in Oslo's Aker Brygge area. 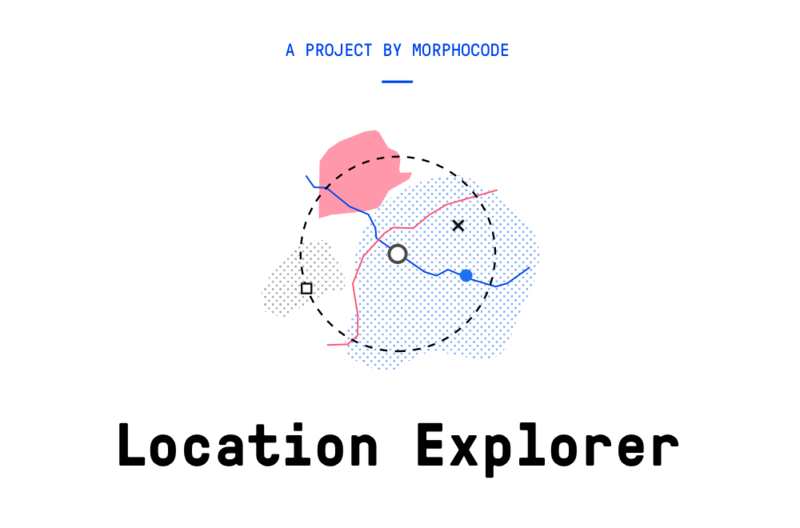 Image by Morphocode. 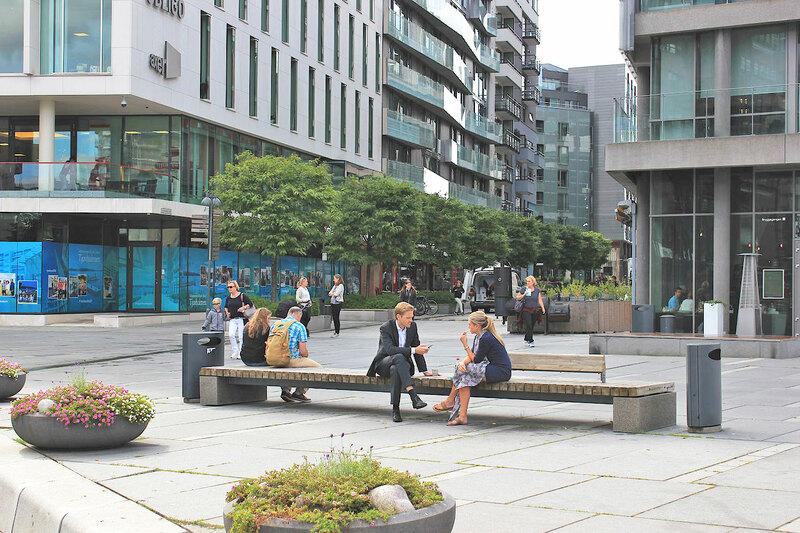 A comfortable place to sit and enjoy street life requires benches and all the other benefits of a vibrant urban environment such as street food, public events or simply a fountain ledge to relax on. The presence of tree canopy and shade, as well as the quality of the light and the availability of ground-level activity are essential for bringing people together. Another important metric for a comfortable walk is the sidewalk width and the ratio of building height to street width that affects our sense of enclosure. A 1:3 ratio is considered to be the golden standard that allows people to experience a comfortable walk and seek both prospect and refuge. In the last few months we’ve been working on a new tool called Location explorer. It will allow you to explore various urban performance measures, one neighborhood at a time! 2. Brueckner, J. K. (2011), Lectures on Urban Economics, MIT Press, Cambridge, Massachussets. 11. 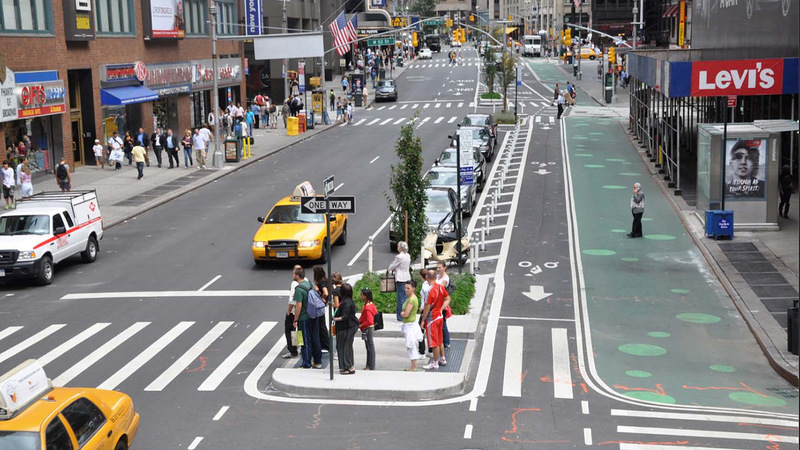 Transit Street Design Guide by National Association of City Transportation Officials. Island Press ISBN: 9781610917476. 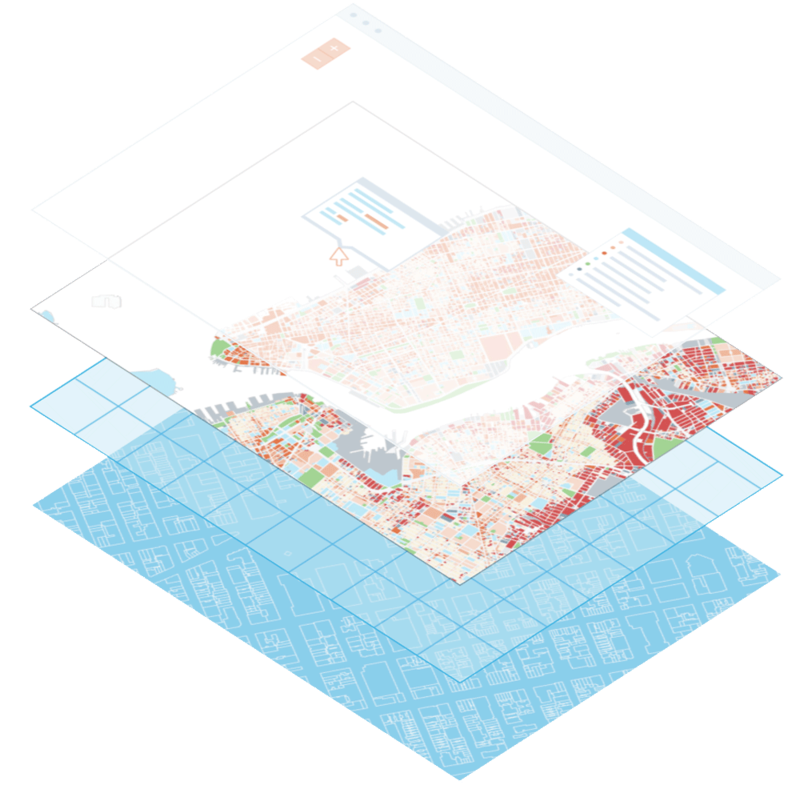 Our video course Mapping Urban Data is now available! It contains 30 carefully organized and beautifully illustrated videos that will lay a solid foundation to your mapping skills.